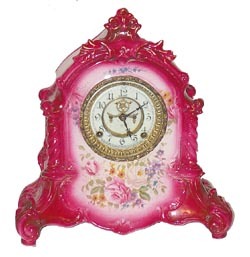 Ansonia Clock Co. Royal Bonn case, "La Verdon", ca 1901. One of the larger porcelain cases at 14 1/2 inches high, and 13 1/2 inches wide. Decorated in the ever poplar decorator colors, many shades of red, with pink, white, yellow, and purple roses and other flowers. A light sprinkling of gold striping. Movement is 8 day, open escape on the 2 piece porcelain dial. There are major hairlines on the dial ring. I will pack a new outer ring with the clock, you install it. It is also missing the back door. I will include one of those also. There are no breaks, or chips in this beautiful case. This is one that should bring $1500 or more. Ly-Ansonia No.2642.